Our soap is made using only the finest naturally sourced ingredients. All bars are handmade using the environmentally friendly and traditional Cold Process Method of soapmaking. This results in soap that is high quality, glycerin-rich, and naturally moisturising, both eco-friendly and skin-friendly. The base of each bar is blended from pure vegetable oils and butters - olive, coconut, shea, castor and cocoa. All added nutrients are also of natural origin, with essential oils used to give any scent. There are no artificial ingredients - no colours, preservatives or synthetic fragrances. SLS, SLES and paraben free. Full ingredients are given on the individual shop pages. After mixing and shaping in molds, each soap batch is hand-cut into bars before being well cured. Being handmade and hand-cut, each bar may vary slightly in size and appearance. Please allow to drain and dry between uses to keep firm. Our soaps are entirely palm oil free, unlike most other handmade or mass-produced soap. Green Forest Soap is made instead using rich blends of other pure natural vegetable oils and butters - mainly olive oil, coconut oil, caster oil, shea butter and cocoa butter. 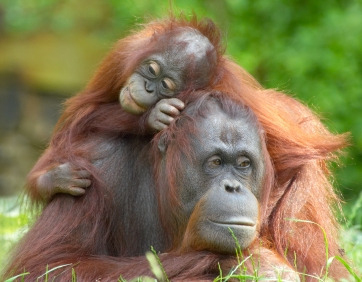 Palm oil free is a deliberate choice in support of the orangutans and other inhabitants of Indonesia and Malaysia whose rainforest home is rapidly being destroyed to make way for vast oil palm plantations. 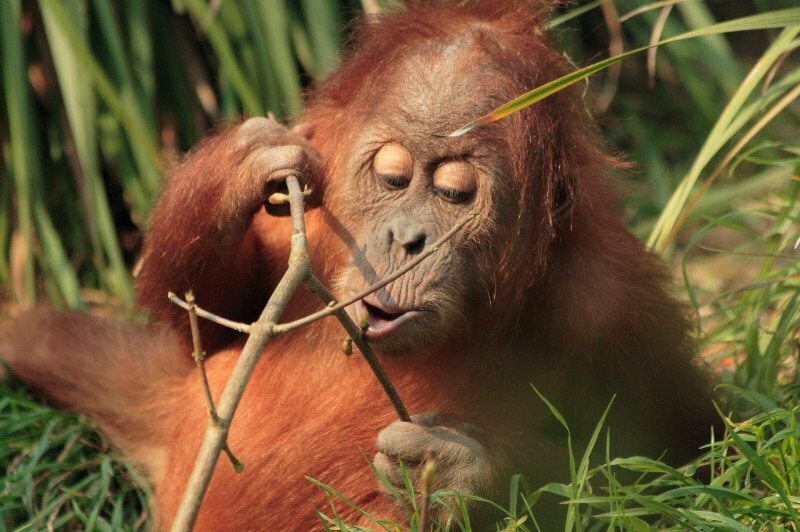 Thousands of species are under threat, and orangutans could soon be extinct in the wild. Palm oil is found in very many other everyday products - from cooking oils, confectionary and bread, to cosmetics, body products and cleaning agents. However, on labels it is very often hidden as 'vegetable oil' or as one of many other names. 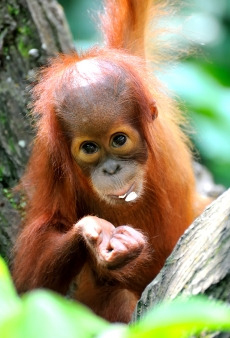 Many more photos of orangutans can easily be found on my Pinterest Orangutans board - a link to this is located via the Pinterest button on the top left of this page. (My Pinterest page also contains photo boards for Forests, Chimpanzees, Bonobos, Gorillas, Monkeys, and much more). No animal content - no ingredients used are derived from animals. The products sold here have not been tested on animals. Free from cruelty. Environmentally friendly - no harsh chemical additives. Non-toxic. All ingredients are also sourced from companies within the UK. UK orders over £25 free!